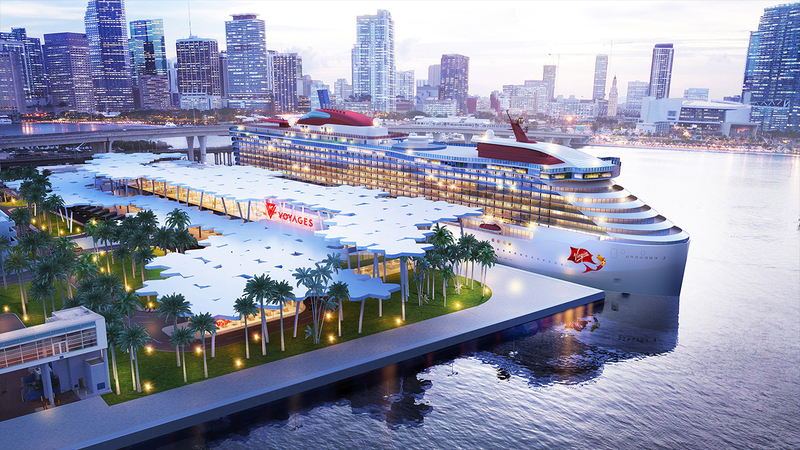 Render of the Virgin Voyages terminal in PortMiami with Scarlet Lady and the downtown Miami skyline at dusk. As the Scarlet Lady comes together deck by deck, we wanted to build a home port fit for our Lady Ship. From the decor of the bars to every detail of the cabins, we partnered with a creative collective of top-notch designers from around the globe to craft our Scarlet Lady. When it came to our Virgin Voyages terminal, we decided to look for top-notch talent in our very own backyard. Pending the Board of County Commission’s approval of the MOU for construction of a new cruise facility, our new terminal (and future home) is planned for PortMiami. Seeing how we will be setting up shop in the heart of Biscayne Bay, we wanted to be sure we worked with a firm that understood how to highlight and honor the Magic City. That's why we joined forces with Miami-based architecture and design firm Arquitectonica, the visionaries behind projects such as the American Airlines Arena in Downtown Miami, Brickell City Centre Complex in Brickell and the Miami City Ballet in South Beach. Render of terminal's VIP entrance at ground-level with Scarlet Lady in the background. Our goal with the terminal? To highlight and emphasize those things people love about Miami and give a nod to the past in our unique Virgin way. For years visitors have been attracted by the city's sun-soaked beaches, invigorating atmosphere and gorgeous, iconic sights. No sight more recognized than the Royal Palm Tree lounging carefree amidst a backdrop of captivating Art Deco design. These palm trees, tall and regal, relaxed yet unwavering, were the inspiration for the structure that will become our sanctuary in the bustling bay. To pay homage to these venerable palms, we wanted to design something that will make every sailor feel like they’re having an authentic Miami experience from the moment they catch a glimpse of our mesmerizing terminal. In planning to bring life to a slab of hot concrete overlooking the beautiful downtown cityscape, Arquitectonica decided sailors could use a little shade before boarding the scintillating Scarlet Lady. 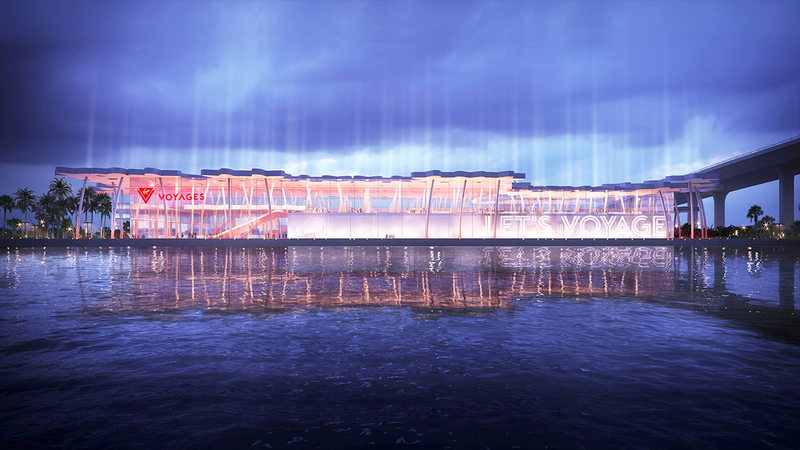 Render of terminal's West facing side in the nighttime with dozens of lights shooting into the sky. 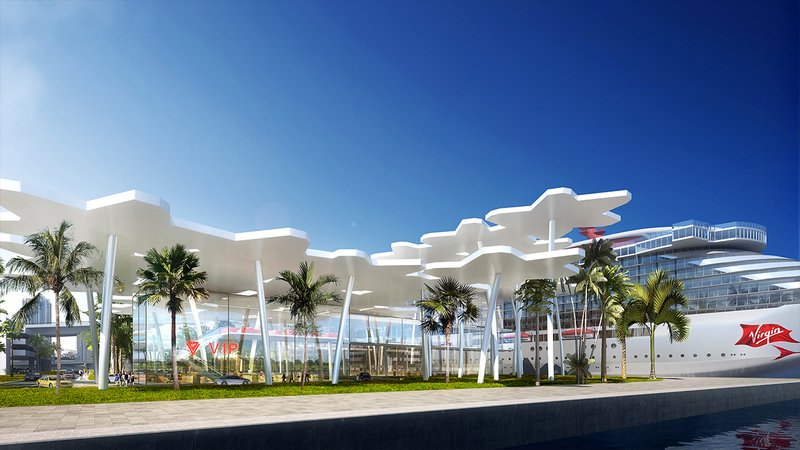 The terminal’s rooftop is designed to resemble a palm tree grove with pockets that allow natural light to flow into the building by day, and gorgeous beams to light up our iconic Virgin Voyages logo (as well as the Miami sky) by night, allowing our future home to shine brightly. The two-story storm-proof glass facility will be replete with lush landscaping giving the terminal a plaza-like feel with designated areas for VIP drop-offs, as well as ride-sharing and provisioning — all designed to provide a seamless shore to ship experience. As soon as sailors begin to cross the bridge onto our port’s planned future home on Dodge Island, it will be impossible to look away from the elegantly crafted structures that blend seamlessly to form a canopy of permanent palm trees anyone can enjoy. Our own Virgin Voyages palm grove. With so much left for sailors to discover, can you believe we haven't even set sail yet?